Combine flour, sugar, salt and active dry yeast. Add water to make a dough. The dough will be sticky, but you should be able to knead into a soft dough. Add olive oil and knead well. Knead it for 5 minutes and set aside in a greased bowl covered with plastic wrap for an hour. After an hour, take the dough out of the bowl. It would have risen to twice its size. Place it on a flat surface and knead it again. If you wish, for added flavour, you can knead a little portion of chopped chillies and crushed garlic into the dough. Roll it into a rectangle. In the centre, spread grated cheese, crushed garlic, chopped green chillies and grated butter, evenly in that order. Now, wrap it like an envelope. 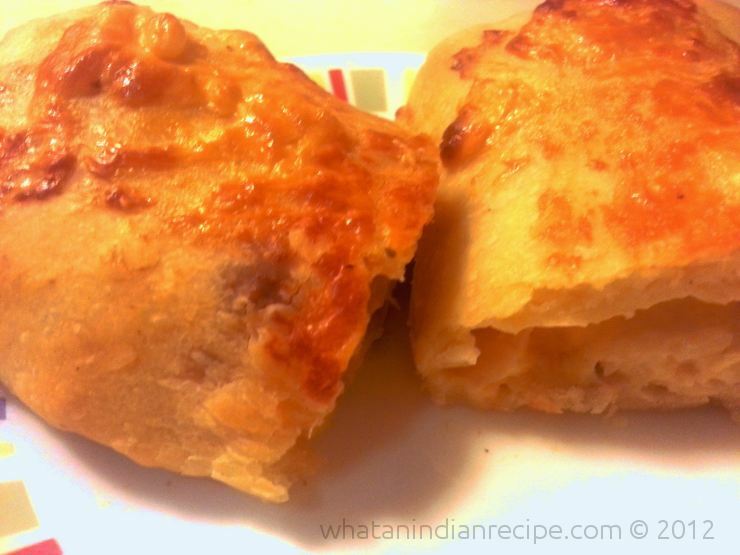 Make sure that the thickness of the dough is not less than 1 inch on any corner, or else, the cheese will leak out. Brush the dough with olive oil and sprinkle some cheese on top. Place it on a baking tray with the thick side on the bottom and place it in the oven. Check in 15 minutes. The crust should feel crispy on touching and should look bubbly and golden.